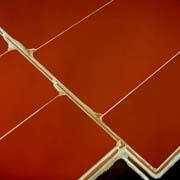 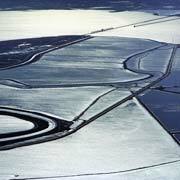 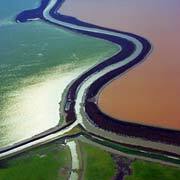 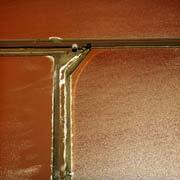 The Cargill salt ponds are located in San Francisco Bay in the cities of Newark, Redwood City and Napa. 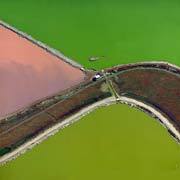 The Napa operation was closed approximately sixteen years ago, and the ponds are slowly reverting to a natural state. 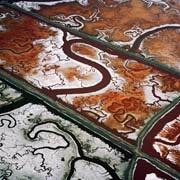 The property was donated and sold to the State of California for wildlife protection in 1994. 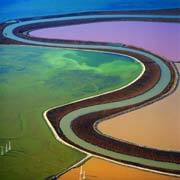 Anyone who has looked out the window of an airliner approaching San Francisco International Airport on a clear day has seen this multi-colored pallette of evaporator and crystalizer ponds in the South Bay. 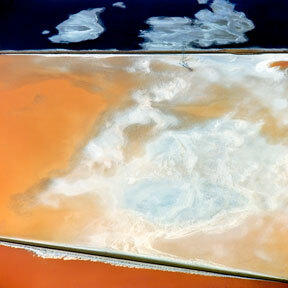 This is where table salt is produced. 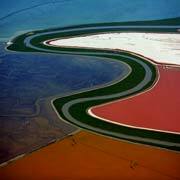 I first noticed these ponds when I was learning to fly in the mid 1960s. 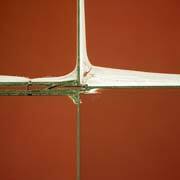 The geometric patterns provided good reference points for practicing certain required aerial maneuvers. 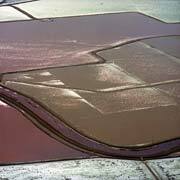 Several years later, when I was studying photography at San Francisco State College, I began photographing the ponds. 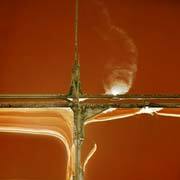 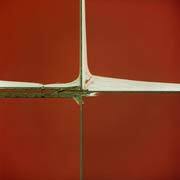 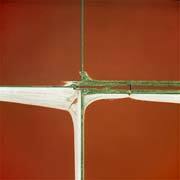 I was fascinated by the combination of the abstract and the real -- it was Diebencorn with a drawbridge, Thiebaud with a transmission tower or Pollock with a powerline. 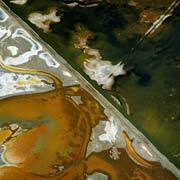 Over the years, I spent many hours turning circles over the area and now have a large portfolio of salt pond images. 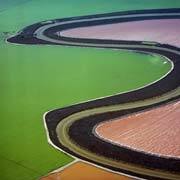 The area is constantly changing -- with the seasons; with the weather and with the age of the ponds. 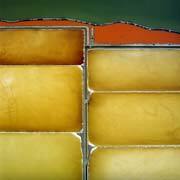 Each time I visit the area, I discover something new. 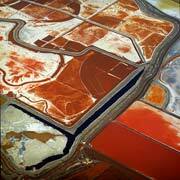 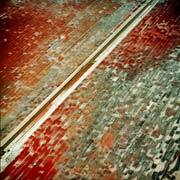 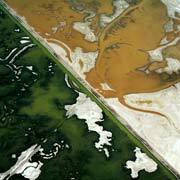 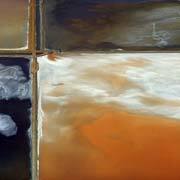 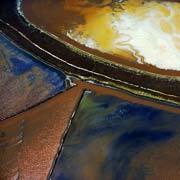 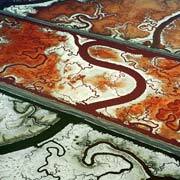 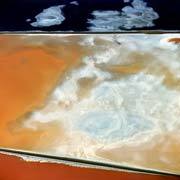 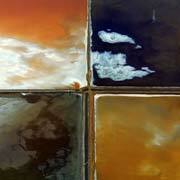 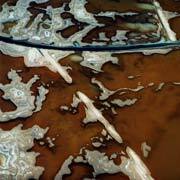 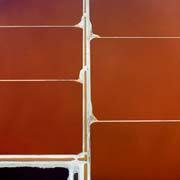 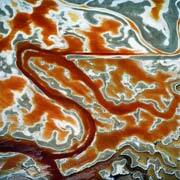 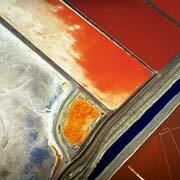 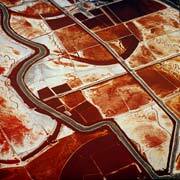 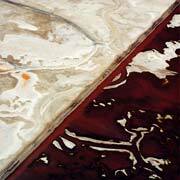 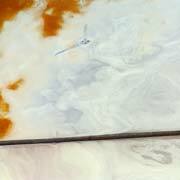 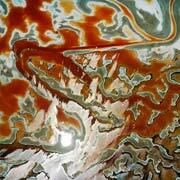 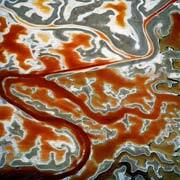 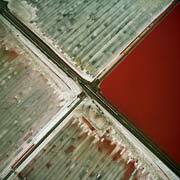 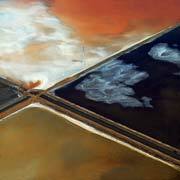 The palette of colors that makes the salt ponds so beautiful is created by a complex ecosystem. 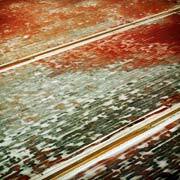 The colors range from pale green through deep coral pink to bright red. 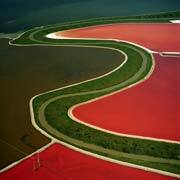 The color indicates the salinity of the ponds. 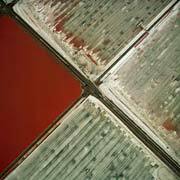 Micro-organisms change their hues as the salinity of the pond increases. 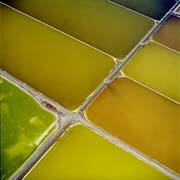 In low to mid-salinity ponds, green algae is predominant, giving the water a deep greenish cast. 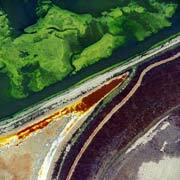 As the salinity continues to build up, an algae called Dunaliella shifts the color to a lighter shade of green. 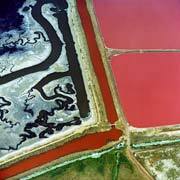 In middle to high salinity ponds, the Dunaliella produces a red pigment. 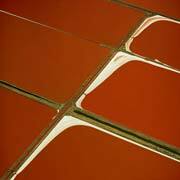 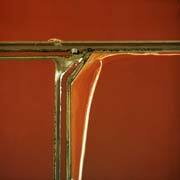 Millions of tiny brine shrimp lend an orange cast to the water in mid-salinity ponds. 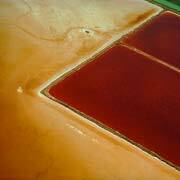 Salt loving bacteria such as Stichococcus also contribute red tints to high salinity brine. 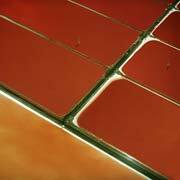 Water is drawn out of the ponds through natural evaporation, and during the five years it takes for the bay water to mature into salt brine, it is moved from one evaporation pond to another. 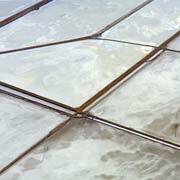 In the final stages, when the brine is fully saturated, it is pumped to the crystalizer where a bed of salt 5 to 8 inches thick is ready for harvest. 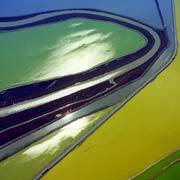 These ponds and the marshes that surround them are important habitat for more than 70 species of birds, including several endangered species. 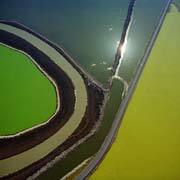 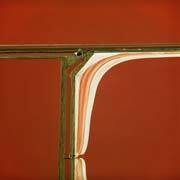 In 2005, federal and state agancies acquired 16,500 acres of Cargills's solar evaporation ponds for wildlife habitat. 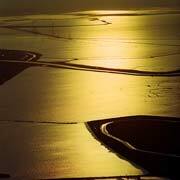 Cargill continues to harvest salt on 9,000 acres within the " Don Edwards San Francisco Bay National Wildlife Refuge" (DESFBNWR) while marsh restoration and habitat enhancement plans are being realized on approximately 40,000 acres in the north and south bay.